Our Holy Father Cyril lived during the reign of Emperor Constantius (337-361), son of Constantine the Great. Being the son of pious and orthodox parents, he was educated by them and raised with piety and correct doctrine. When the Archbishop of Jerusalem departed to the other life, the blessed Cyril was raised to the archiepiscopal throne of Jerusalem. There he was a champion for the Apostolic and Patristic doctrines. At that time the Arian Acacius sat in the episcopal throne of Caesarea in Palestine. For this he was swiftly renounced and deposed at the Local Synod of Sardica, for he refused to confess the Son as consubstantial with the Father. He did not acquiesce to his deposition however, but held on to the throne of Caesarea like a tyrant, for he had friendly relations with Emperor Constantius, who was minded towards the trivial opinions of Arius. Having received authority from the emperor, he had the blessed Cyril removed from his throne, and exiled him from Jerusalem. 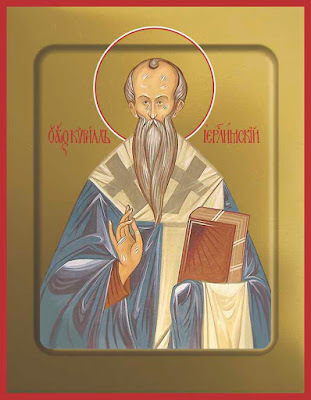 The divine Cyril went to Tarsus of Cilicia where he lived with the wondrous Silvanus. 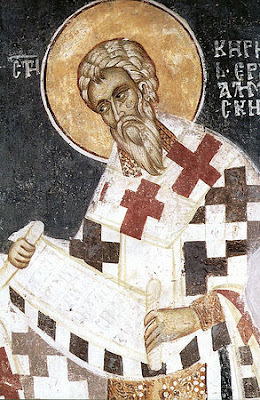 When a Synod gathered in Seleucia, and Saint Cyril had a place there, the cacodox Acacius left the Synod and went to Constantinople, where he slandered the divine Cyril, thus igniting the anger of the emperor against the Saint, and so he was condemned to exile. When Constantius died, Julian the Apostate received the empire in 361, and wanting to pull in with goodwill and love those Bishops that were exiled by Constantius, he ordered all the exiles to return to their regions. Together with others, the Saint once again received the throne of Jerusalem. Therefore he shepherded the flock of Christ entrusted to him well and with love for God, and he left behind for the Church of Christ a memorial of his wisdom, his work known as Catechesis, as well as other discourses, and having lived a few years following his return, he reposed in the Lord with a blessed end. According to his physical description, he was of average height, yellow in color, with hair on his head, a short nose, a rectangular face, straight and even eyebrows, and a white shaggy beard divided in two, and his disposition was like a farmer or villager. Clothed in a robe of godliness, thou wast seen in Zion as an illustrious pillar of the Apostles' Faith. Thou didst become an heir of their grace, and didst set forth their pious doctrines, and dispense their talents of wisdom. Pray for us, O Cyril, our Father and our Hierarch. Thy divine words for the Church of Christ, are endowed with authority from heaven; in teaching us the knowledge of Truth thou didst reveal the radiance of holiness. And by thy intercessions thou dost heal our sufferings, O godly-minded Father Cyril.